Tourtière (French pronunciation: ​[tuʁ.ˈtjɛʁ], Quebec French : [tuʁ.ˈt͡sjaɛ̯ʁ]; also popularly referred to in Canada in print and in its pronunciation as tortière) is a meat pie originating from Lower Canada (now Quebec), usually made with finely diced pork and/or veal, or beef. Wild game is often added to enhance the taste of the pie. It is a traditional part of the Christmas and/or Christmas Eve réveillon and New Year's Eve meal in Quebec, but is also sold in grocery stores all year long. Tourtière is not exclusive to Quebec. It is a traditional French-Canadian dish served by generations of French-Canadian families throughout Canada and the bordering areas of the United States. In the New England region of the U.S., especially in Maine, Rhode Island, Vermont, New Hampshire, and Massachusetts (e.g. Chicopee and Attleboro) late 19th and early 20th century immigrants from Quebec introduced the dish. There is no one correct filling, as the pie meat depends on what is available in regions. In coastal areas, fish such as salmon is commonly used, whereas pork, beef, rabbit, and game are often used inland. The name derives from the vessel in which it was originally cooked, a tourtière. 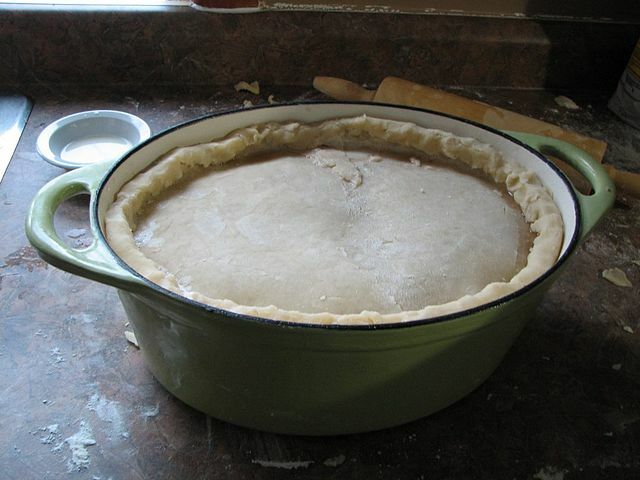 The tourtières of the Saguenay-Lac-Saint-Jean area and Eastern Quebec are slow-cooked deep-dish meat pies made with potatoes and various meats (often including wild game) cut into small cubes. Elsewhere in Quebec and the rest of Canada, this variety of tourtière is sometimes referred to, in French and in English, as tourtière du Lac-Saint-Jean or tourtière saguenéenne to distinguish it from the varieties of tourtière with ground meat. Tourtière in Montreal is made with finely ground pork only (which can be hard to find as the meat is often ground too coarsely elsewhere). Water is added to the meat after browning and the addition of cinnamon and cloves is what makes it unique. Many people use ketchup as a condiment, though the tourtière is also often eaten with maple syrup or molasses, or mango chutney. Although it is less popular than the original tourtière and the tourtière du Lac-Saint-Jean this version can also be commonly found throughout Canada and its surrounding areas. Manitoba is home to the largest French-Canadian population in Canada outside of Québec. Tourtière is an integral part of holiday-time meals for French Canadians in St.Boniface, Winnipeg's French Quarter as well as in Manitoba's many Francophone rural areas. Browned meat is seasoned with varying combinations of savory, nutmeg, cloves, cinnamon, celery salt, dry mustard, salt and pepper. Pies are served with mustards and various types of relishes.